Captain Americas in a race across the world to solve a mystery from World War Two! James Bucky Barnes has led many lives. 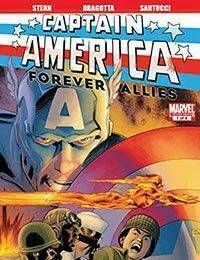 Once he was Captain Americas partner Bucky, a proud member of the Invaders, a founder of the original Young Allies. Now he is Captain America, the Sentinel of Liberty, and when an old enemy suddenly reappears, Jim must re-open the last, unsolved case of the Young Allies- to stop a menace that threatens the world!